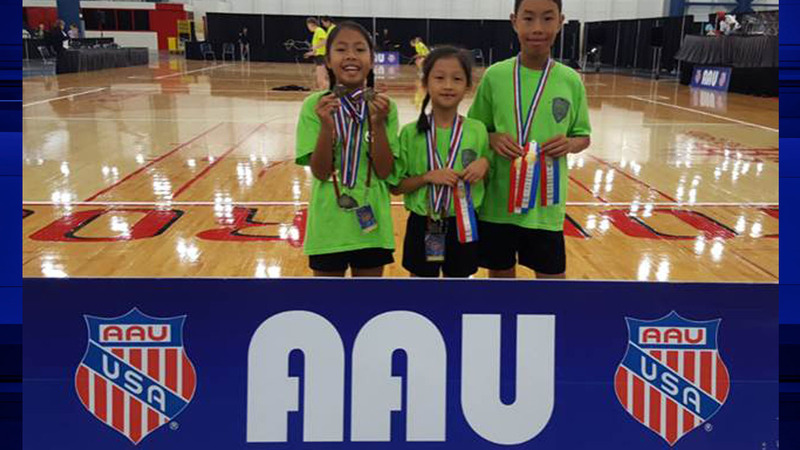 Three Katy ISD students won 13 medals in jump roping at the 50th AAU Junior Olympic Games held in Houston July 27 - August 6. The Rope Warriors' Miyo Fujiwara of Randolph Elementary, Aileen Liang of Kilpatrick Elementary and Justin Liang of Tays Junior High earned seven gold medals total, with 9-year-old Aileen Liang taking home a gold medal in the All-Around competition. The team also won two silver medals, including one for Justin Liang, age 11, in the All-Around event. They rounded off their competition with four bronze medals and several other top 10 finishes. The AAU Junior Olympic Games are known as the largest national multi-sport event for youth in the United States. The AAU was founded in 1888 to establish standards and uniformity in amateur sports.